The old adage of “buy low and sell high” works, but it isn’t that cut and dry in today’s self-storage market. This is particularly true when self-storage properties are selling for a premium. It can be daunting to compete against well-funded operators and real estate investment trusts (REITs) for desirable facilities. This book is designed to give you the tools to effectively find quality properties, analyze risk and compete with the larger players for acquisitions. 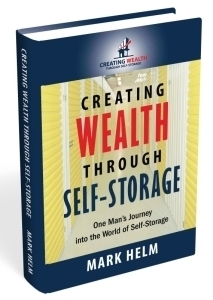 Author Mark Helm explains in detail how he learned to strategically acquire facilities to fulfill predetermined parameters and a business plan—all with limited startup funds. If you prefer to purchase this book in a digital PDF format, click here. Mark Helm, CCIM, is a commercial real estate agent who started working with REITs in the mid-1990s to locate and purchase self-storage properties. As he learned the business, Mark struck out on his own to invest in self-storage and purchased his first project at the beginning of the 21st century. Through trial and error, he created a strategic system of analyzing and buying storage property, and today is working toward a goal of building a $60 million portfolio. Mark has also created a cloud-based, financial-analysis software program, “The Storage World Analyzer,” which is now available through the ISS Store.